« Review: figma 036: Asahina Mikuru Combat Waitress ver. 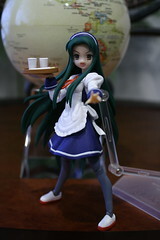 Today I review the lovely Tsuruya-san in her yakisoba waitress uniform. This outfit hails from episode 12 of the anime series named Live Alive (ライブアライブ) in which Tsuruya and Mikuru’s class is running a yakisoba stand. 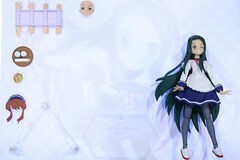 Tsuruya provided the outfits, naturally, and it does look very good on her, nyoro? 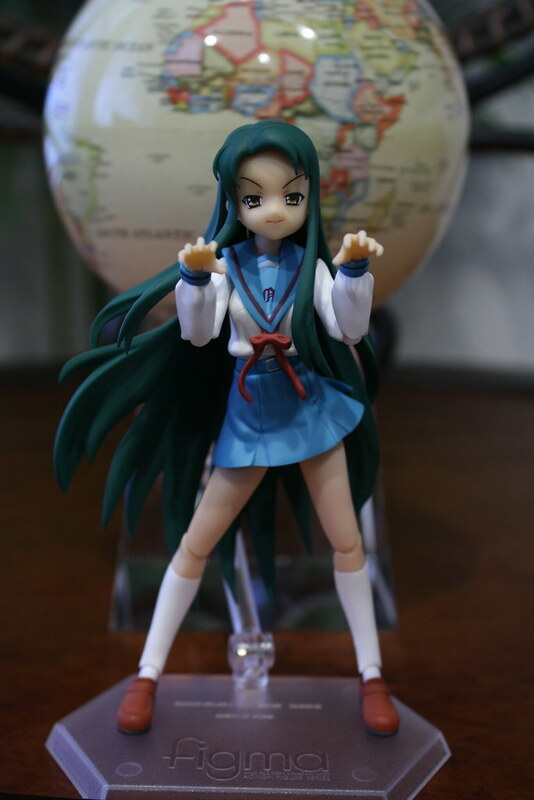 This version of Tsuruya-san comes with the standard set of figma accessories; the 3 jointed stand and base, an extra face, and set of hands. 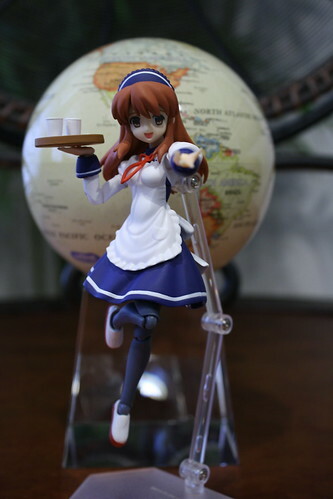 Her hands include 2 standard fists and accessory hands, a special hand with a peg in it that goes in the tray that is included for the right hand, a pointing finger for the left hand, and 2 “creeping up on you” hands that are supposed to be from when Tsuruya was mind-controlled by Nagato in the movie the SOS-dan made. Additional accessories include the aforementioned tray with 2 cups of water and a set of chopsticks, a paper plate piled with yakisoba (which looks quite delectible I must say ;) and an alternate set of bangs for Mikuru so you can use one of her heads on this body to have a Culture Festival Mikuru too! Cons: For some reason my Tsuruya’s bangs are really loose. The figma hole in the back is also a little loose. I may have to use the waist clip from Saber Lily on this figma. The pen in the left hand doesn’t really go into the hole all the way, so the tray will fall off sometimes. Also, the cups and chopsticks are loose, so they’ll fall off a lot if you’re not careful. A dab of putty will rectify this however. It was disguised as a loot post which is probably why you had a hard time finding it, sorry. 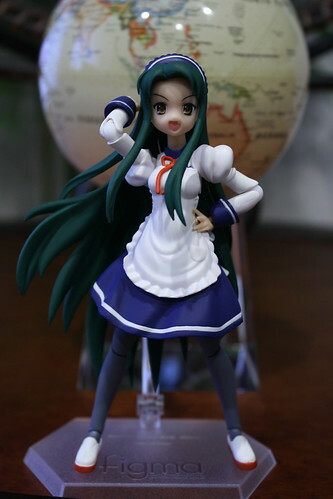 Did you ever review the 008 Tsuruya figma? I was hoping you did, just because I wanted to see what sort of things you’d do with Emiri’s swappable head. They both look great! 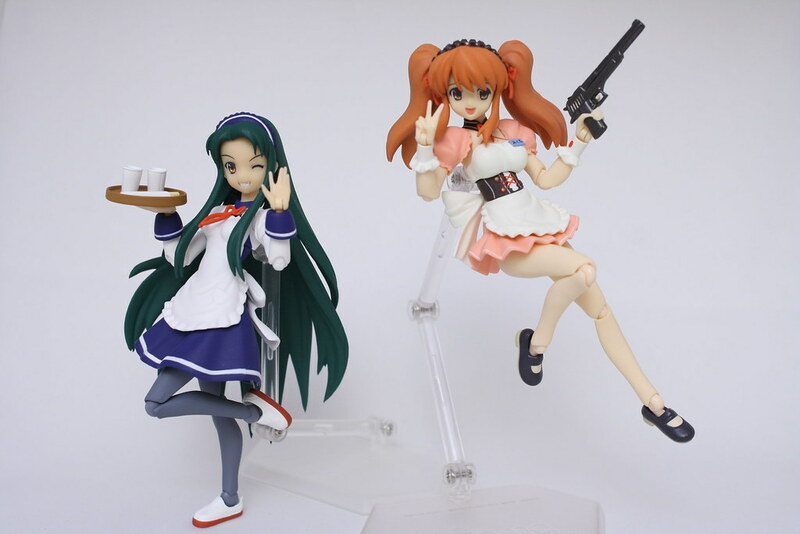 That means I have to buy 2 of them if I want both Tsuruya and Mikuru…..
love the maid costume ^^ havent arrive at my place yet T_T….